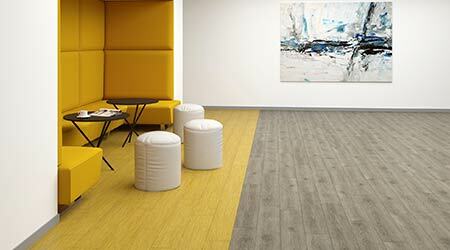 Crossover LVT is available in both loose lay and click format. Offered in 7-by-48-inch planks, products feature an embossed texture for a realistic wood feel and provide relevant and modern color options for use in commercial design. A high performance resilient designed for high demand environments, Crossover features a 20 mil wear layer for superior durability. The matte finish is polish and buff optional for hassle-free maintenance, and the 5 mm product construction allows for installation alongside carpet without the need for transition strips. The product features a 10-year underbed warranty when installed with advanced adhesive Shaw 4100 or S150.